The Liberal Democrats began writing their own political obituary when they decided to go back on their pre-election promises to vote against any increase in tuition fees in order to allow the Tories to triple university fees to £9,000 per year, making study at English public universities the most expensive in the world. This betrayal was particularly stupid given that the student lobby were one of the core Lib-Dem demographics. This U-turn was so bad that huge numbers of people who voted Lib-Dem in 2010 because they likes their stance against the commodification of the education system have sworn to themselves that they will never ever vote Lib-Dem again. People aren't just temporarily angry about this, they are enraged because as far as they are concerned, the Liberal Democrats stole their votes. 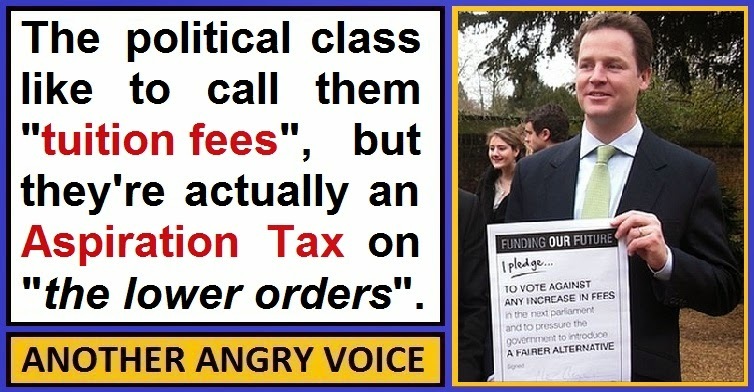 The fees that the Liberal Democrats helped the Tories to introduce are not just three times as high as the New Labour fees, they also come at a much higher rate of interest. Instead of being index linked directly to the rate of inflation like the old loans were, the new loans accrue interest at the rate of inflation plus 3%. Even with interest rates being held at all time historic low of 0.5% for the last five years the government now admits that they got their sums badly wrong and that 45% of graduates will never earn enough to pay off their loans, rather than the 28% they originally predicted. There are two main consequences of this huge miscalculation. The first is that the government now admits that their massive hike in student fees is already perilously close to failing to break even, meaning that not only will it cost millions of students extra, it also looks extremely likely that this new system will actually end up costing the taxpayer extra too. The second consequence is that millions of graduates look set to spend their entire working lives making payments towards the cost of their higher education. These repayments kick in at £21,000 per year and are administered through a 9% direct taxation (taken directly from the salary like income tax and National Insurance). Around half of students will spend their entire working lives paying this 9% Aspiration Tax without ever actually paying the loan off. The government narrative was that this hike in fees was necessary in order to "put higher education on a sustainable footing for the long-term" but the fact is that the huge increase in student fees is already perilously close to failing to break even, and just one negative economic factor (such as a recession, natural disaster or even a rise in the rate of inflation) could drive the new student loan system deep into the red. If putting "higher education on a sustainable footing for the long-term" was actually such an important factor, it's clearly an indicator of grotesque incompetence that the plan is already dangerously close to not breaking even after just a couple of years. There is an alternative explanation for the implementation of a scheme which will result in a massive hike in the levels of student debt, and that is the idea that the 9% Aspiration Tax has been deliberately imposed on students from poor and ordinary backgrounds as a social barrier, designed to hinder social mobility. The explanation arises from the answer to the question of who actually benefits? The taxpayer doesn't look set to benefit, since the scheme is already perilously close to failing to break even. The majority of students won't benefit, because they look set to leave university with average debts of around £60,000 for an education they would have received for free less than two decades ago, and 73% of them will be still paying off their student debts in their 50s! The universities are certainly not benefiting either, since they've had their funding slashed again and again since 2010. The fact is that the most obvious beneficiaries from the introduction of this Aspiration tax are the children with parents wealthy enough to pay the fees for them. The children of the wealthy establishment already have loads of huge advantages in life, and the imposition of a 9% Aspiration Tax on "the lower orders" when they get uppity and try to better themselves, is an excellent way of further protecting the privilege of the children of the establishment minority. For parents who can afford to send their children to private schools like Eton (£34,000+ per year in fees), Harrow (£33,000+ per year in fees) or Westminster (£33,000+ in fees), it would hardly be an enormous stretch to cough up an additional £9,000 per year so that their children can avoid ever having to pay the 9% Aspiration Tax that is imposed on graduates from "the lower orders". It's easy to see how imposing an additional 9% income tax on the lower orders would create yet another life advantage for the children of the establishment class. The 9% Aspiration Tax is a method of confiscating disposable income from "the lower orders" so their financial means are even more diminished. This means that there will be even less competition from below for the establishment class. If two people, one from an establishment family and the other from an ordinary background, qualify with the same class of degree at the same university and end up earning the same salary, the establishment graduate is at a huge advantage when it comes to setting up their own business, because they won't have to pay the 9% Aspiration Tax. This means they will have more disposable income to invest in establishing their own business. The 9% Aspiration Tax levied on graduates from ordinary backgrounds also puts the establishment graduate at a huge advantage in life when it comes to other things too, such as buying a house, or starting a family. In my view, you'd have to be a very gullible person to naively accept the government narrative on the reasons behind any of their schemes (no matter which party is in charge). Anyone with an inquisitive mind should consider alternative explanations. In my view the alternative explanation that makes a hell of a lot more sense than the official explanation, is that the main beneficiaries from such a scheme will be the children of the establishment, ie, the children of the very MPs who voted in favour of the introduction of Aspiration Taxes for graduates from ordinary backgrounds in 1998, and then voted to triple them in 2004, and then to triple them again in 2010. Some people might say that it's unreasonable to assume such sickening ulterior motives from the political classes, and complain that the idea that they would deliberately hinder social mobility to protect the privileges of the establishment class is unconscionable. However these people are probably not familiar with the education secretary Michael Gove's assertion that "some people will, apparently, be put off applying to our elite institutions by the prospect of taking on a debt of this size. Which, as far as I'm concerned, is all to the good". Even if the government narrative is unquestioningly accepted, and analysis of who the main beneficiaries are is completely ignored, the fact that the government were so far out with their calculations should be grounds for sacking the universities minister David Willetts. However, just like other grotesquely incompetent Tory ministers like Iain Duncan Smith and George Osborne, he's seemingly immune from censure for his failings. Once again, like so many other political issues, the introduction of Aspiration Taxes for graduates from ordinary backgrounds boils down to a simple choice between grotesque incompetence, or outright malice. There is simply no other explanation. If the Green party have the best policies, why does hardly anyone vote for them? What is ... a Justificiation Narrative?